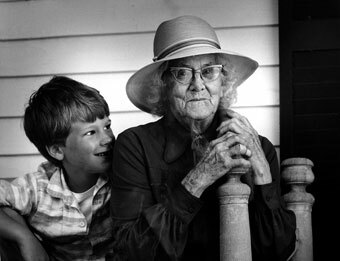 Every Thursday Charley’s mother drops him off for an afternoon visit with 83-year-old Maddie, while she takes casseroles to some of the island shut-ins. The two sit together on the side porch watching Maddie’s cat play with her new kittens. Charley listens with great attention while Maddie tells him stories of her many years working as a summertime nanny for Charley’s father, and years before, for his grandfather. Charley knows most of the stories by heart, but never tires of hearing them. When the tide drains the harbor in front of the house, they put on their waders and head for the beach, digging up clams to feed to the cat and her new arrivals. It’s a tradition 60 years in the making and Charley loves carrying the clam hod back to the house, like his father and grandfather before him.